This funky polypore is primarily western in distribution, growing on the undersides of fallen conifer logs (especially on the wood of spruces). 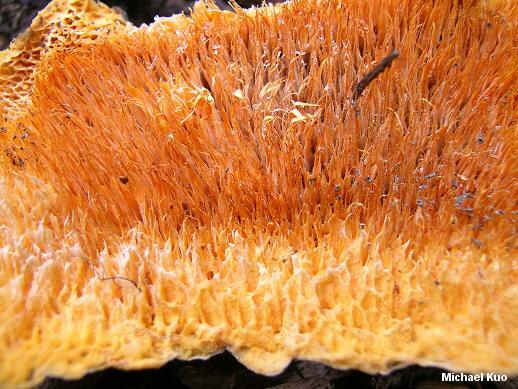 Its spongy orange fruiting body is usually mostly "resupinate" (lacking a cap or stem), and its large pores soon begin to erode and appear more like teeth than pores. 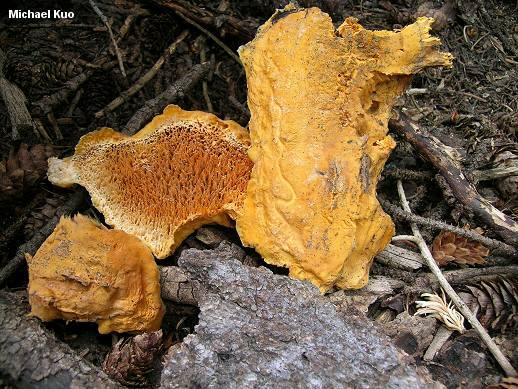 Other orange polypores include the Chicken of the Woods, Laetiporus sulphureus, which features overlapping caps, tiny pores, and fleshy consistency; Pycnoporus cinnabarinus, which grows on the wood of hardwoods and features a well developed cap, tiny pores, and leathery flesh; and Pycnoporellus fulgens, with somewhat better developed cap, smaller pores, and different microscopic features. Ecology: Saprobic on the dead wood of conifers (especially the wood of spruces but also recorded on the wood of firs, hemlocks, and pines) and rarely on the wood of aspens; causing a brown cubical rot; spreading across the undersides of downed logs; annual; summer and fall (but the spongy fruiting bodies often survive the winter); primarily found in western North America in montane regions, but encountered rarely in northeastern North America. The illustrated collection was made at 11,000 feet in southwestern Colorado, on the wood of Engelmann spruce. 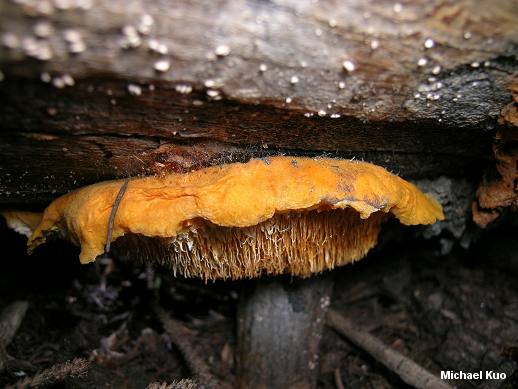 Fruiting Body: Usually lacking a cap but occasionally with a rudimentary caplike structure along the upper edge; spreading for as much as a meter or more; peeling easily from the wood; flesh and upper surface (when present) soft and spongy, felty or finely hairy; tubes up to 2 cm long; pores angular, 1 mm or more across; pore surface eroding to create an irregularly toothed appearance; flesh thin; all tissues bright orange, fading to paler orange. Odor and Taste: Odor not distinctive, or mealy. Chemical Reactions: All parts bright red with KOH. Microscopic Features: Spores 9-14 x 3-3.5 µ; smooth; cylindrical or long-elliptical; hyaline in KOH; inamyloid. Hymenial palisade hyaline in KOH, contrasting with bright red hyphae of the tube trama. 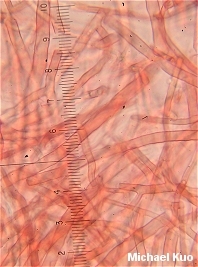 Cystidia frequent; irregularly cylindrical; hyaline in KOH; 60-120 X 5-10 µ. Contextual hyphae bright red in KOH; frequently branching; mostly thin-walled but occasionally with thick walls; roughened; 2-10 µ wide. REFERENCES: (Ellis & Everhart, 1895) Kotlaba & Pouzar, 1963. (Overholts, 1953; Gilbertson & Ryvarden, 1987; States, 1990; Phillips, 1991/2005; Lincoff, 1992; Evenson, 1997; Barron, 1999; Trudell & Ammirati, 2009.) Herb. Kuo 08080507.